Beautiful Oceanfront Seaside Condo with Amazing Views! Condo Studio-1 Bath, (Sleeps 3 with pull out 5" mat), great views- Beachfront! Beautifully Remodeled Oceanfront Studio Condo #202 is located on Seaside's famous promenade. This condo has a stunning ocean view and is 50 feet from the beach! Picturesque and serene in its location, yet within walking distance to Seaside's fine dining, shopping, sightseeing and all other attractions that Seaside has to offer. Be sure to ask for your free unlimited use passes to Sunset Empire located less than a mile away which features a 25 Meter Pool, Therapy Pool, Hot Tub, and Fitness Center! 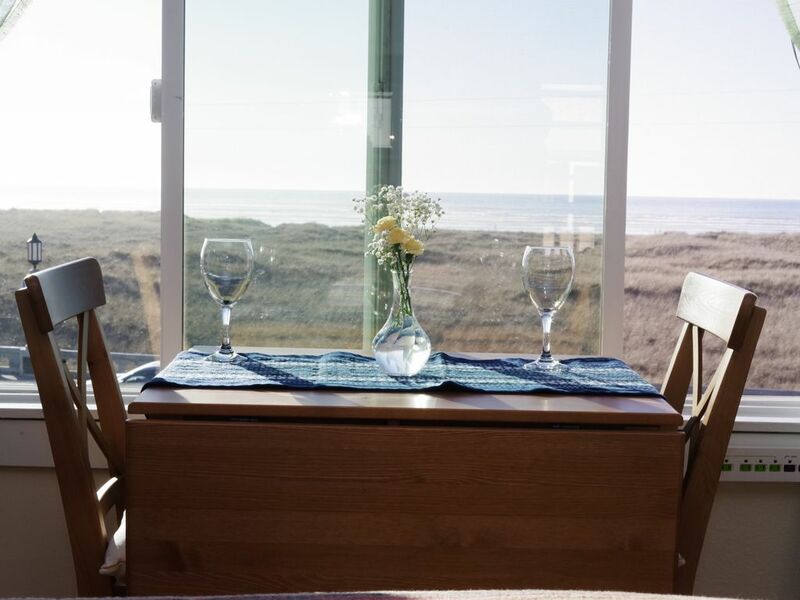 This unit offers spectacular views of the Pacific Ocean and Tillamook Head and is right next to the sandy beach! While staying in Seaside, popular activities include: kite boarding, surfing, clamming, crabbing, hiking, golfing, antiquing, shopping as well as simply enjoying the beautiful sunsets or storm watching and walking along the beach! Enjoy the new WiFi enabled HDTV with digital cable and HBO channels and remember to bring your movies to enjoy on the new Blu-ray player, or pick a couple out in the Office video library (no charge!)! Also, the Studio has free wireless internet access. The elegant corner fireplace will keep you warm with ambiance or on a hot summer night you may choose to enjoy the flames without the heat; simply control the fireplace using the remote control. If you would like to eat in, you will find this unit well-stocked with a mini refrigerator, stove top, and microwave as well as all of the kitchen necessities including: dishes, pots and pans, coffee maker, tea pot, and toaster. Complimentary coffee/tea is provided in the unit. Also available is a picnic basket equipped with plastic plates and utensils which is perfect for a picnic on the beach! Food delivery menus are also available and of course if you would like to dine out, there are many wonderful restaurants and shops and only a short stroll down the Promenade! It takes only minutes to walk to the quaint heart of Seaside as well as the Seaside Convention Center. Free passes are available in the office for unlimited use of the lap pool, therapy pool, hot tub, and fitness center located less than a mile away at the Sunset Empire Rec Center! This unit offers a new comfortable queen bed along with a 5' pull out sleeping mat for a 3rd person. All linens are provided and room cleaning is on-site and included in price. This condo is pet friendly- Pet fees are $20.00 one pet 1st night, and $30.00 for two pets- $10/$15 additional nights.. Rates are double occupancy, additional persons are $8 per night each. For your entertainment, you will find a variety of games and puzzles within the condo. Also, please feel free to search for leisure reading material from the book basket. Take the book home if you aren't finished reading and return it when you visit us again! You may even want to bring a book to share with others next time you come by contributing to the book basket. Be sure to sign our guest book and tell us if it is your special occasion! Oceanfront Condo #202 in Seaside is a fabulous place to escape to year around! We purchased our Seaside Condo 202 in 2016 because we love visiting the ocean and wanted to create something that guests could enjoy too. Seaside offers so many wonderful, fun activities. The condo has been recently remodeled and offers a relaxing get away for those who visit! It is so peaceful and serene! Located in a quiet, residential neighborhood filled with older (i.e. 1890's- 1920's) homes, on the beach- yet still within about a 10 minute walk down the Prom (the boardwalk here in town) to Downtown Seaside and all the attractions, shopping, and dining options one could want. Housekeeping included at no charge. Outdoor patios and BBQ's are available. Digital Cable w/HBO West and HBO Family. Ask the office for Beach Toys! Great lawn in front of the property can be used for games, sunset watching, etc. Beautiful outdoor patio area with tables, umbrellas, and seating. HDTV, Cozy Infrared Fire Place, Picnic basket with utensils for picnicking at beach, book basket filled with leisure reading books, puzzles and games. Ask for your free passes (at the Office) for the Sunset Empire Recreation Complex. This little room was perfect for our planned anniversary trip! Right on the prom, with a great view - we spent every night by the little electric fire place, sipping tea and watching the sunset. It doesn't get more romantic than that! The property managers are extremely friendly and the room was clean and quiet. There is just a small kitchenette, so you won't be making any three course meals, but it was big enough for us to cook our oatmeal and tea for breakfast and then head out on the town for the rest of our meals - which is exactly what we wanted. It was the perfect, relaxing weekend we needed. Thank you Katherine once again for staying with us- and we do hope you'll be back this way again...sooner rather than later! The view was fantastic. The location was perfect. Could walk to Broadway in minutes. For what we did (which was just relax), worked out great. Very clean. Kitchenette (we didn't use). Nice shower. Loved the fireplace (electric). It was cozy. I'm glad to hear that you had a nice, relaxing stay and hope you'll be back again soon! The place was perfect for one person (and my dog!). Thank you. Thanks again Annie- we're glad we could accommodate both you and your 'pooch'! Great place! Had rain sun clouds & even snow! And the view is fantastic. Easy walk to everywhere. Small but cozy & well appointed. Friendly folks too! Thank you again Dusty for staying with us, and we look forward to your next visit! This is a small room but is very well laid out and offers everything you need for a two or three night stay. The room has a marvelous view and was impeccably clean. They more than cater to pets. There's a doggie amenity on the counter when you arrive and they provide pet towels and a water and food bowl. Michael and Judy are warming hosts and all of the staff we encountered were very friendly and personable. We'll be back! Thank you Gayle for all the nice comments- we truly appreciate our Guests as there are many lodging options here at the beach- and we couldn't be happier that you chose us...until next time best wishes! The small studio had everything we needed and was just like the pictures. Beautiful ocean view! Staff was very helpful when we checked in. Looking forward to coming back. Thank you again Donna for staying with us here at the beach, and we hope to see you again soon. Happy Holidays! Single nights booked must be paid in full prior to arrival. Please note there is a 2 night minimum stay required during July and August, Special Events, and Federal Holidays, if available. Rates are double occupancy, additional persons and any pets must be declared and fees paid upon check in. Please note- Pet fees are $20.00 one pet 1st night, and $30.00 for two pets- $10/$15 additional nights. - for stays longer than 1 night (and/or 2 pets) the additional fees are due upon check in at the property. For all reservation stays beginning July 1, 2016 the new Oregon State Lodging tax will be in effect (1.8% instead of 1.0%)- local lodging taxes (8.0%) remain unchanged at this time.